Vanessa Williams, internationally known, pop-R&B recording artist, producer, dancer, model and actress, is pleased to introduce her first skincare and beauty collection – Vanessa Williams ReVitalistic Skincare. 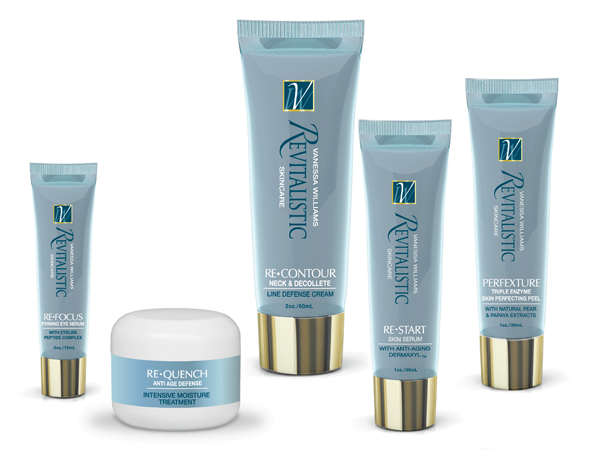 Beginning August 3, ReVitalistic Skincare will be available exclusively on QVC, and online at www.QVC.com. ReVitalistic Skincare offers a unique approach to skin. After weighing the opinions, and traveling the world to test the products of well-known international dermatologists and aestheticians, Williams shares her secret solutions for a wide variety of skin problems women face every day. The products’ gentle, effective active ingredients and complexes are responsibly formulated, omitting known or suspected harmful ingredients. All product details, from the refreshing ginger scent, to the quick-absorbing application of the creams and serums, were selected by Williams who used her own personal struggle with skin problems to find the right combination for women everywhere. “Texture matters to me whenever I put a product on my face, so I’ve created rich, luxurious blends with a smooth complex for the collection, giving a weightless feeling I know everyone will love,” says Williams. Vanessa Williams ReVitalistic Skincare will be available exclusively on QVC and online at www.QVC.com. Tune into The Lisa Robertson Show from 8-10 PM to watch Williams discuss ReVitalistic Skincare. Prices range from $48.00-$68.00.